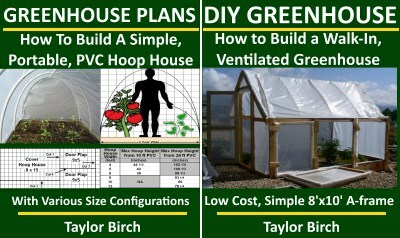 When we decided we needed a greenhouse to grow warm-weather vegetables in our cold vegetable climate, we started doing the research about what kinds of greenhouses were available for purchase and what kinds of greenhouses we could build ourselves. While doing the same internet search you are doing now, we quickly discovered there are dozens of very nice looking greenhouse kits available for sale. Yes, they are nice, but we decided we are not interested in spending thousands of dollars on a hobby greenhouse kit. We also quickly rejected the idea of spending $400 – $500 on a flimsy looking plastic cube with a zipper that someone calls a cold frame. I have a friend that jokes about the time, effort and money he spends growing tomatoes and figures his home grown tomatoes cost about $200 per pound. I could have my Southern relatives Fed-Ex ripe tomatoes to me cheaper than that. But cost isn’t everything, because there is no comparison to the taste of home grown tomatoes. For us, doing without home grown tomatoes and other fresh garden vegetables is not an option, but we have to find a way to grow them that does not start out by draining the saving account. Talking about “green” is very popular these days, even the oil companies do it, but living green must also include not wasting the green (money). 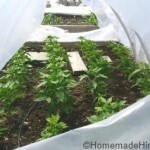 OK, so we were going to DIY build a greenhouse, so what are some considerations for planning, building and operating a greenhouse to grow warm-weather crops in our cold weather climate? What size (sq ft) greenhouse do we need? How tall does the greenhouse need to be? What kind of greenhouse do we need? What kind of materials do we use to build the greenhouse? Is the total cost of factors 1-4 above reasonable? Will the greenhouse be a permanent or temporary structure? Will the greenhouse be easy to construct with tools I have? Will the greenhouse be easy to maintain? Will the greenhouse be easy to open for ventilate and re-close to retain heat? Will we include any additional technology to help operate the greenhouse? Will the greenhouse hold up to the expected wind, snow and animals? For starters, we knew we wanted our first greenhouse to cover our existing raised garden beds (5 ft x 10 ft; 50 square feet). We also knew we wanted a simple design that could be moved from one raised bed to the other in order to rotate crops. And we also knew our first crop would be either tomatoes or peppers, so the greenhouse would probably need to be 5 or 6 feet tall to accommodate tomatoes, but only need to be 3 or 4 feet tall for peppers. 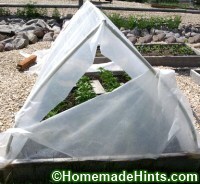 We also decided to build a small A-Frame version of a Hoop House type Greenhouse made from PVC pipe and covered with plastic (polyethylene sheeting). We also wanted the greenhouse to be portable, so instead of permanently connecting the PVC pipe with PVC cement, we attached the pipe with zip-ties. The actual cost for our first greenhouse was less than $35. We also need to include the cost for the raised bed ($32), because the existing raised beds provide a lot of weight and structural support, so the greenhouse frame doesn’t have provide all the support. The combined cost was less than $70. 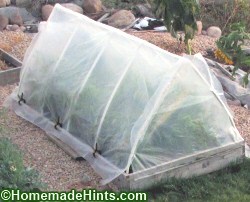 The greenhouse is ventilated by simply opening the top of the door flap about a foot or so. 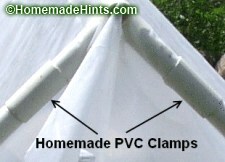 If more ventilation is needed, the flap is simply opened any amount we want or by completely opening one or both ends. One person can remove the entire plastic sheeting in less than 2 minutes and it can also be replaced by one person in about the same time if the wind isn’t blowing too hard. If it is windy, you might need help holding the plastic in place so it can be clamped into position. Since there is no technology for automatic ventilation, we have to pay attention and remember to ventilate the greenhouse when the inside temperature starts to rise above 85°F (29°C). If we are going to be away for a few days, we have to decide if it is better to leave the greenhouse open for ventilation or closed to hold the heat in. Luckily, we are not usually susceptible to frost and extreme heat on the same days. Our first greenhouse was simple and the only technology we included was an automatic watering system, which we already had in place. Not only do we live in a cold area, our climate is also very dry and we need a watering system in order to have grass, shrubs and trees. I had already connected drip irrigation lines to the raised beds from one of the the watering zones. There is basically no maintenance to the greenhouse except to check that clips are in place. At the end of the growing season, the greenhouse is dismantled and stored for the winter. So far, we have only used the cheap utility grade plastic covering, so it must be replaced each season. When we use up our existing supply of plastic, we plan to buy a UV protected plastic that should last for four years. So far, the greenhouse has held up to snow and to 70 mph wind gusts. Deer or elk have not yet run into or through the greenhouse, but that is always a possibility. Luckily, the large animals head for the high country about the same time we start setting up the greenhouse, but deer have been known to nip a few of the garden plants that were not protected within the greenhouse. 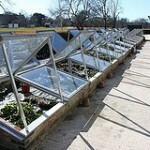 I found this product, do you know anything about it and how do you think it would perform as a greenhouse covering? Yes, that is our greenhouse and we use this greenhouse every year to grow warm weather veggies (like peppers or cantaloupes) in our cool climate. it with my everyone! Thanks for this very useful info.